KRAKOW, Poland (CNS) — Poland’s memory and identity are the two catalysts that will lead the country forward and turn hopeless situations — such as those facing migrants — into opportunities for future generations, Pope Francis said. Cloudy skies and a light drizzle did little to dampen the spirits of pilgrims cheering loudly as the pope’s plane landed in Krakow July 27. The arrival ceremony at Krakow’s John Paul II International Airport was marked by the presence of hundreds of Polish men and women, dressed in traditional clothes and dancing. 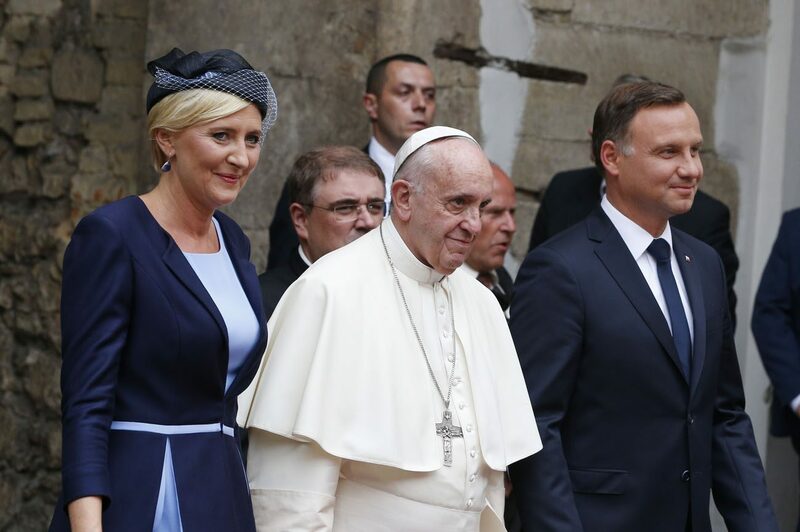 Stepping down from his plane and before he departed for Wawel Castle, Pope Francis was greeted by Cardinal Stanislaw Dziwisz of Krakow, Polish President Andrzej Duda and first lady Agata Kornhauser-Duda. Addressing civil authorities and members of the country’s diplomatic corps, the pope noted that “memory is the hallmark of the Polish people;” a notable characteristic of his predecessor, St. John Paul II. He said being aware of identity was “indispensable for establishing a national community on the foundation of its human, social, political, economic and religious heritage,” but that people must remain open to renewal and to change. He added that while good memory can remind society of God and his saving work, bad memory keeps the mind and heart “obsessively fixed on evil, especially the wrongs committed by others,” he said. “Also needed is a spirit of readiness to welcome those fleeing from wars and hunger, and solidarity with those deprived of their fundamental rights, including the right to profess one’s faith in freedom and safety,” he said. Pope Francis, who has brought attention to the plight of migrants in the past, met with 15 young refugees prior to his departure to Krakow. The Vatican press office said the young refugees are currently in Italy without documents that will allow them to travel out of the country. “The youths, accompanied by the papal almoner, wished the pope a good journey and a happy participation at WYD, to which they cannot participate but are united spiritually,” the Vatican said. Inviting Polish people to “look with hope to the future,” the pope said the memory of their thousand-year history would create a climate of respect that fosters a better life for future generations. “The young should not simply have to deal with problems, but rather be able to enjoy the beauty of creation, the benefits we can provide and the hope we can offer,” he said. Social policies, he added, must also support families who are “the primary and fundamental cell of society” as well as “helping responsibly to welcome life” so that children may be seen as a gift and not a burden.